A lot of people with Mind Loops (repetitive, negative thoughts and worries) are people-pleasers. I’m not pointing fingers here – because I know first-hand how EASY it is to fall into the people-pleasing trap. When we displease someone, we have to deal with the results. Sometimes that’s anger, or they won’t speak to us – and sometimes we collapse under the weight of guilt or shame. No matter what, we’re dealing with conflict. And who the heck likes to deal with that?! Luckily I’ve learned to ask myself an important question first, when someone is upset with me – so I don’t fall down into the Mind Loop hole. Check out this video where I share de-looping insights that will help shift you out of guilt and worry when someone is telling you you’ve done something “wrong.” You can watch the video here. We all make mistakes, but that doesn’t automatically mean you’ve done something wrong. I’d love to hear from you in the comments: Do you consider yourself a “people-pleaser”? 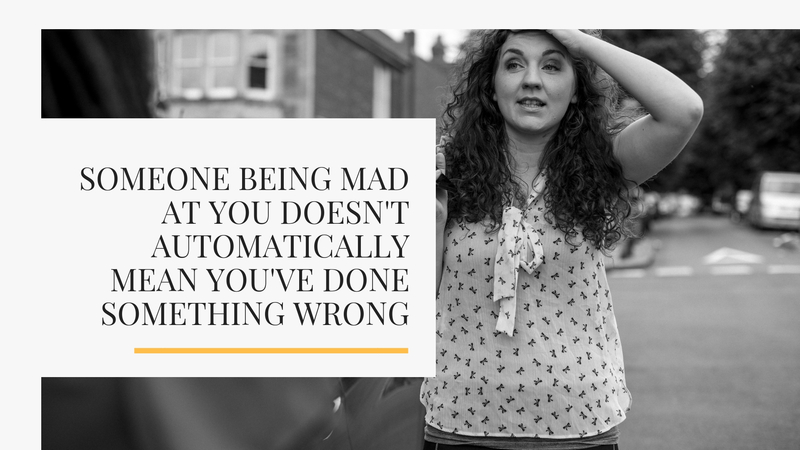 Do you automatically feel like you’re “bad” or “wrong” when someone is mad at you? How does asking this question serve you? And as always, to your happiness.